In the history of fly tying very few books have changed the course of the art. Tube Flies will make a very large impact. This all-color, large format book will amaze you with the beauty of tube flies, their ease of tying and very effective fishing traits. Tube flies can be used for everything from stream trout and surface steelhead to billfish. The rich vein of tube-fly history, innovation, and tying/angling personalities will amaze you and open up a new dimension to our sport! Comment from a purchaser: "Having read a lot about flies, and having tied even more, I always believed that fishing with flies entailed nothing more than the use of a rod, reel & line, and some dry or wet flies. And on a more imaginative day, the use of a nymph or a streamer. 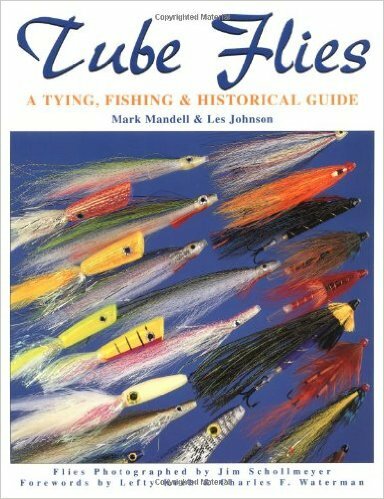 Of course, technique was tantamount important, but never did I imagine that my vision on fly fishing would change as much as when I laid eyes on "Tube Flies" by Mark Mandell and Les Johnson. As far as I know, their book is the first comprehensive book on tube flies. Tying tube flies, and how to fish them make up the body of this book, but much of the flavor of this great read derives from the historical aspects and personal notes by the writers. From salt to fresh water is but a jump, but from a streamer to a tube fly is like entering an alternate universe. Tube flies are different, unlike any other fly, and they require a different approach. The book consists of 6 chapters. Chapter one (1) deals with why one should fish with tube flies, or 'go tubular', as the writers put it. Tube flies can simplify one's tackle, they last longer, and seem to mimic baitfish in a way that hook-tied flies cannot. The next two chapters (2-3) deal with the different types of tube flies, and tell about 'how?' and 'with what?' to tie a tube fly. Next come three chapters (4-6) covering a large number of tube flies currently know to man. Each tube fly is introduced with a color photograph, a brief description, and a step by step tying recipe. Where possible, information about the inventor(s) of a particular tube fly is added, and sometimes one even gets to see its maker. Almost all the tube fly patterns come with expert comments on the fish they have been used on, and how well they caught. This is without a doubt a magnificent book for anyone who wants to venture into the world of tube fly fishing and tying. It is a bright, well written book, with lots of very good illustrations. Descriptions of all the presented tube flies bring them within reach of any fly fisher who makes his/her own flies, but even those among us who don't (yet) may be inspired by this book to start tying their own. A very inspiring read, that cannot be resisted .... one simply has to go tubular. And for those who still hesitate after this, let it be said that tube flies can be used as well in fresh water as they can in the salt water, make no mistake about that!"